Tracey Solicitors are specialists in Wills who believe it is important to help clients deal with all aspects of their Wills as effectively and easily as possible. We have dealt with many clients who have made Wills over the years and are proud of our record of client care. We have prepared more detailed information about making your Will. We use our knowledge and experience to give you the service you need. We offer personal attention, we use plain language and we provide practical and impartial advice. Making a Will protects and provides for your loved ones. It will also prevent unnecessary distress and expense to your relations and loved ones which can occur if a will is not made. A Will allows a parent appoint a guardian for their child. Making a will gives legal status as to what you intend to do with your assets or possessions. We all own something, be it property, car, whatever and we all want to care for our relations and friends after our death. Normally, it is to pass them onto your relations and friends but you might also have some special requests and requirements. As Specialist Solicitors in Probate, we are happy to assist or advise you on any aspect of your Probate. If you need more information, you can contact us. 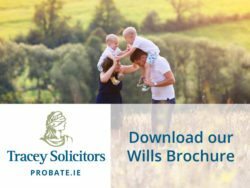 You can start by telling us your query or call us on 1850 940 140 or +353 (0)1 649 9900, Email us at probate@traceysolicitors.ie or we can call you back. After discussing your situation with you, we can advise you how to proceed. We look forward to hearing from you. I would absolutely recommend Tracey Solicitors, especially Maria. She understands her clients very well. She was always straightforward with me This is my first experience with a solicitor and I was delighted with the service. I trusted my solicitor and could rely on them which was a great relief. I highly recommend Paul Tracey Solicitors. They achieved a fantastic result for us, better than we had hoped for. There were many others in the same position as us and nearly none achieved such a result if anything at all. I put this 100% down to Paul Tracey’s knowledge and expertise. Thank you so much. I would recommend your services as friendly and efficient. Any questions I needed answered there was never a problem when I rang.